Tonight I needed a quick dinner for the family as we were home late and tomorrow is the first day of school for the children. After poking around for inspiration for a while I came across the cooked, peeled prawns in the freezer and an idea began to hatch. That idea was prawns in some sort of lemon sauce on pasta. I’m going to assume you can cook pasta – start it before your sauce. Melt butter in a saucepan and add lemon juice, zest and herbs. Whisk rapidly until it emulsifies. Add salt and pepper and cognac, whisking constantly. When it begins to thicken, add a little water (enough to get the desired volume of sauce) and the egg yolks. When it thickens again add the prawns and switch to a wooden spoon for stirring. 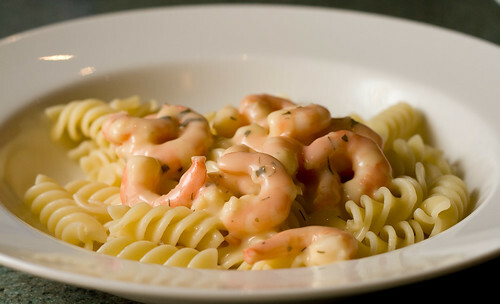 Stir frequently until the prawns are warmed through (your pasta should be done by then). For a slightly less lemony flavour, leave out the zest and add 1 teaspoon of sugar.